A new driveway will enhance and add value to your home from the moment it is installed. MC Paving build a wide variety of driveways including block paving, loose stone and tarmacadam. For your fee, no obligation quotation please call us on 01727 881 806 or request online quote. A modern block paved driveway, laid properly, is more durable than even concrete itself. A substantial sub base is of paramount importance in providing permanence and retaining its value. At MC Paving Ltd we pride ourselves on providing an exceptionally high level of workmanship and customer service. Your complete satisfaction with our work is assured. 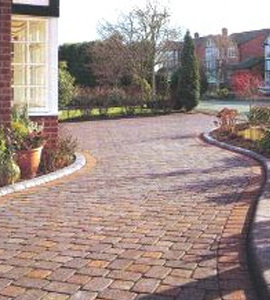 We offer flexible payment terms and our block paved driveways come with a guarantee. We are able to provide this guarantee due to the quality of the foundations we lay. Your driveway will not to crack, sink, dip or have anything grow through it. There are several benefits a loose stone driveway has over other types of driveway surface. Such as, more often than not, you will not have to provide additional drainage for the loose stone as the surface water simply drains through the stone chipping's into the substrate. There are many different colours and sizes of stone chipping's ranging from golden gravel, to pinks, greys, slate blue and greens etc. 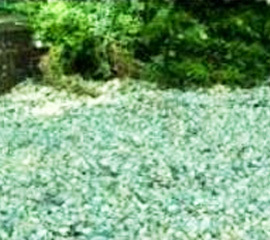 An essential part of a loose stone driveway is a weed stopping fabric that also stops vehicle from rutting. Tarmacadam, properly referred to as bituminous macadam or "Bitmac" can be a cost effective way of surfacing a driveway or forecourt, especially for larger areas. 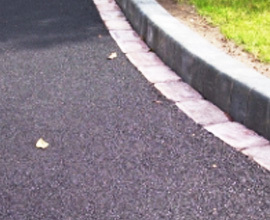 Available in black and red, bitmac is suitable for areas to be trafficked by vehicles, such as drives and forecourts, and can be used for paths. Modern bitmac surfacing using synthetic binding material has been specifically designed to withstand the surface aggravation of power steering.